Udaivilas, Udaipur, Rajasthan | Souvenir. It’s not often I will recommend a resort type accommodation but Oberoi does it in such style here in the Venice of the East that (if you can) you simply have to try it. Perched on teh western edges of Lake Pichola, its numerous domes have become a significant part of Udaipur’s western skyline; shimmering in the distance across Lake Pichola, it could well be mistaken for another of the city’s most majestic palaces but is actually a completely contemporary 2002 addition – typical of the respect to local architecture styles that Oberoi does so well (see Amanbagh). The palatial property features magnificent grounds (beautifully landscaped gardens as well as a wildlife conservatory where deer and peacock roam) and stunning interiors, including a massive central dome, lit up at night, that wouldn’t look out of place on St. Peter’s. Intricately crafted pieces and fabrics are artfully combined with Western decor to create the most elegantly dressed rooms and luxurious bathrooms in Udaipur; accommodations include comforting touches—piles of colorful cushions, linens in the most perfect cotton, and highly original artworks. If you’re interested in landscaping, it’d be well worth your while to explore the resort extensively, seeking out the many beautiful touches—like water easing its way down sky-blue channels or spouting from the trunks of stone elephants—that make this property so special. 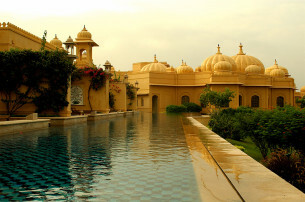 That said, if you’re a first-time visitor to Udaipur, you’ll want to reserve a lake-view room (which automatically has access—from your own personal porch—to a semi-private infinity pool that forms a veritable moat along the length of the accommodations wing); this is the best way of ensuring round-the-clock visual access to the city’s favorite sights. (Then again, some guests find that the shared pool spoils their sense of exclusivity.) Otherwise, book a cheaper room and plan on spending your days at the spa pool (the main resort pool, designed like a monumental step-well, is lovely but lacks views). Service is generally world-class but can be a little matter-of-fact at times. Dining experiences, too, can be quite wonderful, particularly if you reserve an outdoor table for dinner. Even if the food isn’t 100% and tables get cleared before the last guest has left, lights from the historic palaces glitter across the surface of the lake, stars twinkle above, and regular fireworks displays underscore the utter romance of the place. Goan fish curry, Malabar shrimp curry, laal maas (braised spring lamb). As in all Oberois hotels, the staff and service levels are exceptional, all look absolutely beautiful and they are engaging, sincere and intuitive. Don’t mis out on a treatment or massage at the famed Banyan Tree Spa and then a relaxing nap at the Spa Pool afterwards. Also do ask the tireless concierge for the latest Oberoi Udaipur guide, a well put together memo on the city’s latest and greatest activities, from art galleries to shopping to new café’s. if you can afford it request a lake view suite with stairs leading down to the infinity pool – it’s worth it. If you find yourself being allocated a room at the back of the hotel then rather try Taj Lake Palace or the Leela.